American Taliban Not So Talibanish After All? 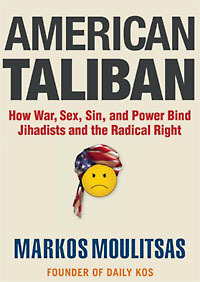 Given the subject matter and his own influence, Moulitsas is sure to find a large audience for American Taliban. This wouldn’t be a problem if the book were a careful comparison of populist nationalist movements, highlighting similarities, underscoring differences, and generally documenting points of congruence between the U.S. conservative movement and populist nationalist groups around the world. But it isn’t. Like [Jonah Goldberg’s] Liberal Fascism, American Taliban is another entry in the tired genre of “my political opponents are monsters.” Indeed, Moulitsas begins the book with the Goldbergian declaration that “in their tactics and on the issues, our homegrown American Taliban are almost indistinguishable from the Afghan Taliban.” And he fills the remaining 200-plus pages with similar accusations. I haven’t read American Taliban and don’t plan to. I figure I already dislike the American right wing enough, so there’s little need to dump another load of fuel onto my own personal mental bonfire. But here’s what’s interesting: this review isn’t on a fringe blog site. It’s not from a reviewer for the DLC. It’s not written by some apostate liberal like Mickey Kaus. It’s written by a mainstream liberal writing in one of America’s premier mainstream liberal publications. Did Liberal Fascism get any similarly incendiary reviews from mainstream conservatives writing in any of America’s premier mainstream conservative publications? Genuine question here. Maybe I missed the bad reviews from fellow conservatives. But the only one I remember on the way to Liberal Fascism becoming both a huge bestseller and a conservative bellwether was a gentle, academic scolding from fascism scholar Michael Ledeen. Does anyone remember any others?